I first saw the Veggetti on Tv as a commercial and I thought, “Wow! This could be great for me since it allows me to make low carb pasta!” I was very grateful for the opportunity to review it and give one away! I decided I would get a little creative with my Veggetti and do something besides the typical spaghetti recipe. The thought did cross my mind to do spaghetti, then, I decided I wanted to focus more on a quick and easy meal that someone could enjoy at lunchtime instead. This recipe takes you only about 10 minutes to whip up as the Veggetti makes it easy to make your “noodles” quickly and get them in your pan. I am personally on a spicy foods kick so I decided to make Spicy Sriracha Cucumber Stir Fry as I figured it would be right up my ally. I made mine very simple and didn’t add much more than a tablespoon or so of green onions to top it, but you really could top it with just about anything-Tofu, mushrooms, peppers, onions, carrots-you name it! Using the Veggetti is super simple! You just place your vegetable in the device (in this case, I used a cucumber) and twist. I did find that cleaning the device is best done right away as food can get trapped in the blades and is almost impossible to get out when it’s dry. The Veggetti is dishwasher safe, though, so that makes it easy. 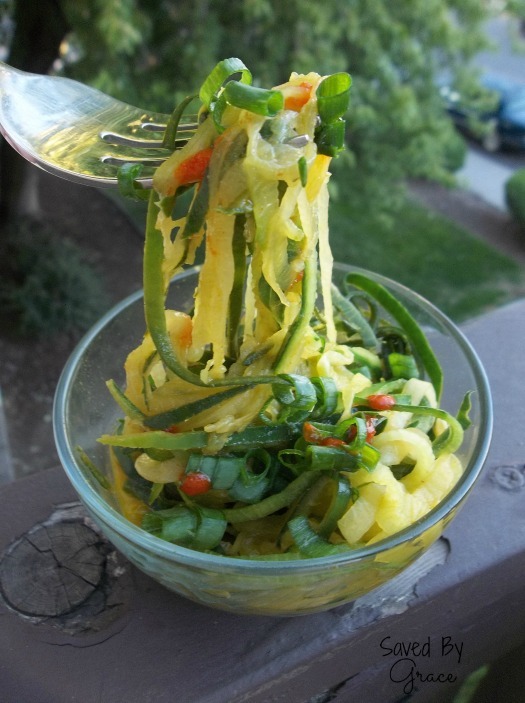 Using vegetables in place of pasta can really save you a TON in carbs and Calories! For instance, ordinary pasta has about 40 grams of carbs per 1 cup serving. Using vegetables only has about 2. Huge difference! Are you ready to make some lunch? Let’s get started! Any add-ins you want; mushrooms, carrots, onions, peppers etc. 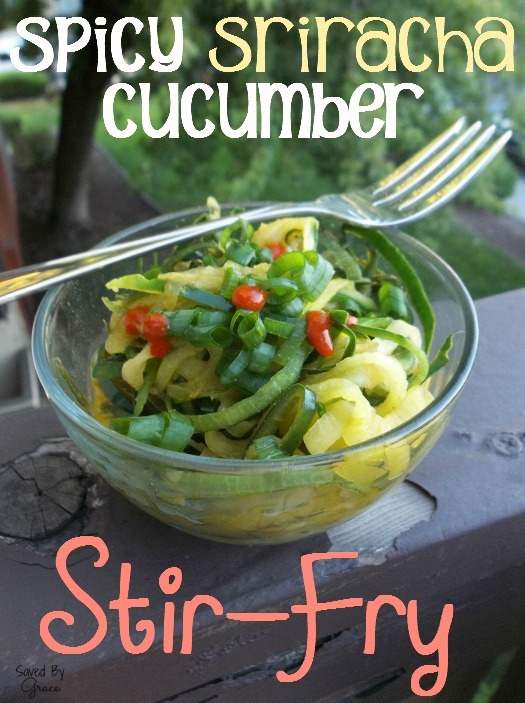 Start by using your Veggetti to cut up the cucumber. Add your oil to a saute pan and heat to medium. Place your add-in vegetables in pan and saute until semi-soft. Add in your cucumber. Saute over medium high heat for 2-3 minutes, flipping. Crush up your chicken boullion cube and sprinkling it on top. Mix in well. You should not need to add water or any type of liquid because the cucumber should have enough in it. Drizzle your Sriracha in and mix in well. Saute for an additional 2-3 minutes. Top with scallions and additional chili sauce if desired. The Veggetti product, gift card, information, and additional gift pack have been provided by Ontel. Id love to win this so I can make eggplant noodles. I want to win the Vegetti because I am on a diet to lose weight. I have to lose this weight, and I want to make healthy vege pasta in my dishes, instead of using flour pasta. This vegetti is amazing product to own and help me lose weight! I want to win a Veggetti so I can make “spaghetti” out of veggies. I’d love to make zucchini pasta! I would like to win this to try out some new recipes that are more vegetable based. I want to win so that I could use it for some of my salad ingredients as well as for making healthy pasta. I want to use it to make zucchini and squash noodles. I would love to experiment with different veges and maybe make a casserole. I have been fascinated by the idea of the Veggetti for awhile; the first thing that comes to mind is the bounty of zucchini in my garden! I would like to use it to make zucchini noodles. 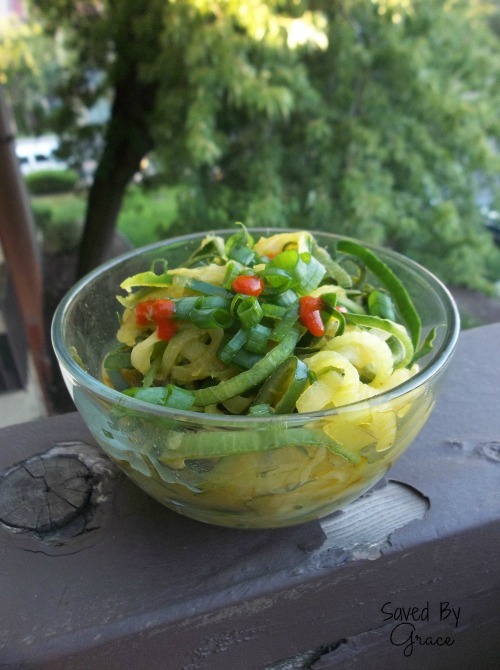 I want to win a Veggetti so I can make my own zucchini noodles and other recipes that are healthy . I want to win it because I would love to try making zucchini pasta.